Desertification is a creeping catastrophe. Already creating millions of environmental refugees worldwide every year, one third of the earth’s surface and the livelihoods of at least one billion people are threatened by desertification, according to the United Nations. Dry land soils contain over a quarter of all the carbon stores in the world. Soil and vegetation loss in the process of desertification release carbon into the atmosphere. This has significant feedback consequences to the global climate system, an estimated 300 million tons of carbon is lost to the atmosphere from dry lands each year. More than 2 billion people in the world live in dry lands. Since the 1850's, the worlds population has increased almost six fold from 1.2 billion to approximately 7 billion. This pace of population growth has led to more dry lands being turned into farmland as demand for food increases. Climate change combined with draining water reserves and unsustainable pressure on these fragile soils leads to desertification. Once an area has become desert it is almost impossible to take the step back to fertile land without vast quantities of water. Less vegetation leaves the land more vulnerable to devastating flash floods, something that is also becoming more common in parts of China. In 2010 China experienced some of the worst droughts and floods in living memory. Arid regions like Minqin in north China are subject to long seasons with very little precipitation and drought spells sometimes lasting over several years. The Gobi desert north east of Minqin is a rain shadow desert formed by the Himalayas preventing rain-carrying clouds from reaching it. When the warm moist clouds hit this enormous mountain range from the south they are forced upwards, dropping all moisture and leaving little for the deserts beyond. China will perhaps suffer most from climate change, with almost one and a half billion people at risk from drier conditions in the north and increased tropical storms and floods in the south. 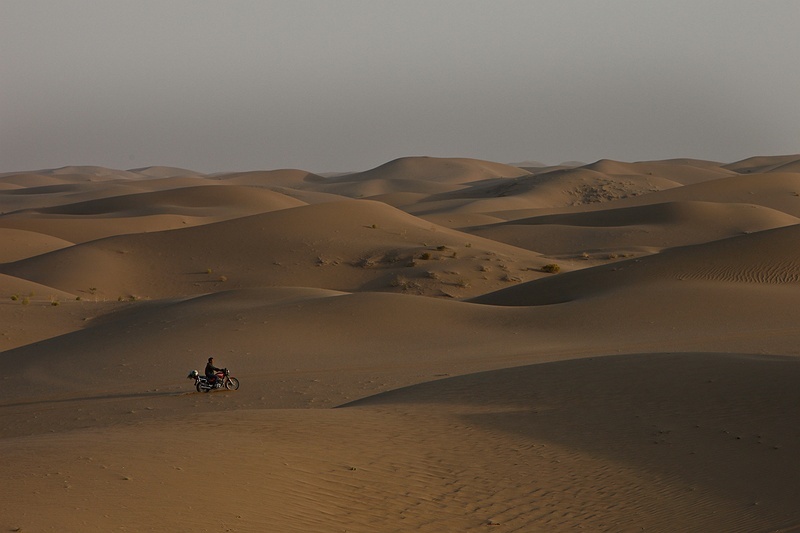 Almost 9 percent of China is desert but the area is rapidly increasing. Entire villages in the north have been lost, submerged in sand, covered by the encroaching deserts. Sandstorms are becoming more frequent from 5 per year in the 1960’s to now sometimes over 24 per year. The Chinese government have tried to fight the spread of deserts with ambitious ecological restoration programs like the planting of more than 40 billion trees over an area the size of Germany. But with investments in dirty energy sources that continue to fuel climate change to expand the economy, these attempts seam sadly futile. 70 percent of China's energy comes from coal. At the same time it is one of the countries now leading the world with renewable energy investment. China is walking a tight rope, balancing the economic interests of it's population with the ability to survive in a changing climate.